We all know that sodas, coffee, tea and sugary foods can stain and discolor teeth. But did you know that certain foods can actually help whiten those suckers up? 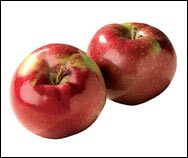 Crunchy foods like apples and celery help clear stain-causing substances off teeth enamel. No one wants puffy undereyes. If you've got 'em, up your intake of vitamin C. Vitamin C reduces inflammation and can help send your bags packin'. Bell peppers are great for this since they're super-high in the vitamin. Oranges, spinach and grapefruits are also rich in vitamin C.
Almonds have amazing anti-aging properties. Not only do they contain a lot of Vitamin E (you know, the vitamin that's often listed as an ingredient in anti-wrinkle creams), but they also contain high amounts of fatty acids (which help keep skin plump and supple), as well as the antioxidant selenium. Just be sure not to eat too many of these crunchy beasts. They have great beautifying properties, but they also contain a whole lotta calories. A handful is plenty! Keep nails strong and moisturized by eating lots of protein. Protein is what builds up keratin; the substance nails are made up of. Skinless boneless chicken breast, lean turkey, tuna and beans are all good (and tasty) sources. Foods rich in vitamin B are fantastic for making dull hair shinier. You can get a lot of "The B" (our affectionate nickname for this vitamin) from eggs, milk, green veggies, and poultry. Silica is also very important for keeping hair elastic, shiny and healthy. Raw oats, cucumber skin, onions and bean sprouts are all major sources of this mineral. Faced with dry, flaky skin? Have fish for dinner! Fish (especially oily fish like salmon) contains Omega-3 fatty acids, which are great for hydrating and nourishing skin. Don't forget. June is National Papaya Month! Papaya is an excellent source of vitamin C and it tastes great, too. Hey! Share these beauty foods with people NOW. Click "send to a friend" ASAP!